Our new Governing Board has communicated the process and timeline for the appointment of an Interim Moderator. They have been working intently as a team since General Conference to ensure leadership and pastoral continuity for MCC in this new triennium, as I prepare to retire as Moderator September 30th of this year. This new Governing Board deserves our support and prayers. They courageously stepped forward in a critical time and had to immediately take on a very solemn obligation – a task we thrust upon them during the General Conference. They are our choice, elected overwhelmingly, to lead us. Let’s have their backs, speak well of them, and pray for them. lay or clergy, spiritually and organizationally. Our Council of Elders, who were visible and present to you at Conference, our Senior Leadership Team, and our Governing Board are a hardy, gifted, and called leadership cohort that will continue to serve you with devotion even as I leave office and an Interim Moderator comes aboard. They will meet together in Washington, DC, USA, in mid-October, with the new Interim Moderator to set the course for the next three years. They will strategize how to deal with the issues that were lifted up at General Conference, how to continue momentum, how to make course corrections, how to heal and grow, and how to creatively embody the global mission of MCC going forward. So, love them, lean on them, and give them the benefit of the doubt and the prayer support they will need to have that unshakeable confidence in the God who called them to this moment. to stay faithful in your MCC assessments and obligations. For much of MCC, though not all, it is summer, the season when church members take vacation, and sometime vacation from giving as well. And, often, churches take a temporary vacation from forwarding the denominational assessments. Please prioritize the global movement of MCC during these months as your leaders continue to serve you. I am mindful of the candidates for Moderator and the Governing Board who were not elected, and so grateful for their service and sacrifice in offering themselves. Let’s pray for them, their next steps, for their continuing call to the vision and mission of MCC. Let’s pray for our nominating committees and those who served our denomination for this General Conference. The staff and volunteers in every area – worship, musicians, preachers, children’s program, accessibility, security, business, transportation, programming of every kind; you are my heroes, you served us so well! Who could have predicted that? I am asking that every MCC church find ways to use it in their worship, teaching, and outreach. I hope every MCC around the world – affiliated churches, emerging ministries, and Oasis groups – will commit to use the Statement of Faith for worship on Anniversary Sunday in early October. Last, but not least, thank you. I was so touched and honored by the plenary at General Conference, in my honor, and the generosity expressed in a love offering. All the cards, notes, gifts thrust into my hands between meetings, and worship services are treasured and deeply appreciated. I have also enjoyed seeing all the video footage sent in by churches and individuals. Many of you expressed your appreciation for the even-handed moderating of a tough and intense business meeting, and I have received that with humility and gratitude. Those 10 hours or less of forums and business were made possible by a team working for years, and intensely for the last several months, so that you would be informed and that we could do our business with dignity, integrity, and hope. What you experienced in my leadership was the product of many hands, hearts, and minds. 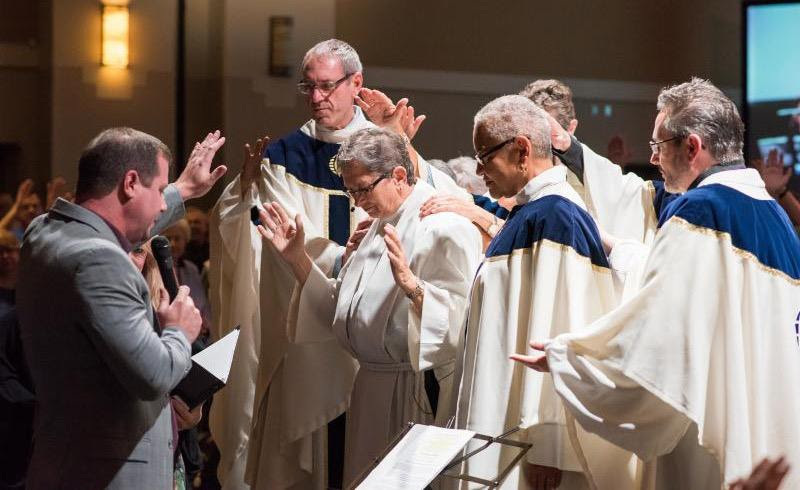 Pray for me as I guide the staff into our transition, and support the Governing Board’s choice of an Interim Moderator; and as I open my heart and mind to what is next for me, personally.